"Falling Forward is an absolute gem of a salute to the married woman, housewife, mother, regular everyday female trooper through this so-called life. The poems are down-to-earth, accessible, understandable, and downright endearingly charming." 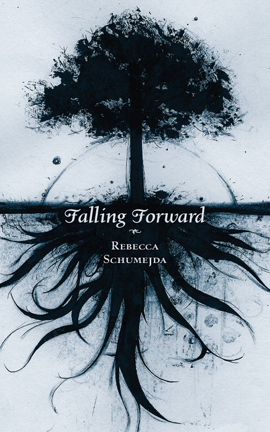 "Falling Forward is a collection of poetry from Rebecca Schumejda, whose verse comes at readers in a positive way. Be it a lesson from mistakes, or simply small practice in a skill, her verse is reassuring and charming. Falling Forward is as inspirational as it is entertaining." “...Rebecca Schumejda’s debut volume Falling Forward follows in the tradition of confessional poets, though its autobiographical content remains modulated by skillful crafting. A singular, assured persona emerges in the book, a grim interrogation of the vicissitudes of marriage and motherhood. ... With her unblinking look at life’s most intimate moments, Schumejda is a courageous new poet." "These subjects recall those of Plath's late work, with magnified focus on the minutia of domestic life. What it lacks despite its wavering spirituality, is Plath's despair. The poems provide no answers, only insight into circumstances, curiosity about new experiences, and a bronze hope that seems to propel the speaker, the poet, Schumejda, into the future, as uncertain and challenging as it may prove to be." "Ultimately, the reader is left with the last poem as an answer to all the problems within. 'Falling Forward' is an apt description of the lives of Schumejda’s characters. They don’t so much move through time as stumble, trying to keep their feet in an uneven world. But '[w]hen the truth is too heavy…[t]here’s no way to avoid failure,' says the narrator. This is the very essence, the underlying motif of each poem, that the only thing you can do is 'just lean forward / let your knees cushion your fall.' ... Very much recommended." In Falling Forward, her first full-length collection, Schumejda dissects human shortcomings with the admission that often “the truth is too heavy, folded like two hands in prayer, filled with weeds and regrets.” While illustrating the perseverance of the human spirit and showing that “falling forward” is still forward progress, these poems invite you to indulge in the familiar threads that tie lives together. Partial transcription from 2/17/09 interview on Poet to Poet / Writer to Writer. Rebecca was also interviewed on Full of Crow and read from Falling Forward. Interview in the Nervous Breakdown.